We have just completed a 'soft launch' of our updated, completely upgraded new website. Prepare for a new and improved purchasing experience at americanframe.com. We invite you to preview it here and use it if you’d like. You might just fall in love with the ease of use, extra functionality and added savings opportunities. So what exactly is a ‘soft launch’? It’s a pre-launch that runs in tandem with the current site. Our goal is to allow you to try it and give us any final feedback before we shut down the old site and switch it over completely. This we expect to do toward the end of December. Exact dates will be posted as soon as we confirm them. To get started, here are some of our most exciting features highlighted below. 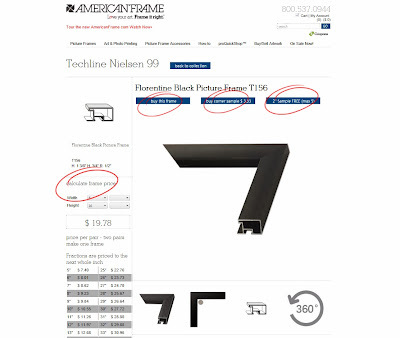 The new AmericanFrame.com sports a visually pleasing, clean bright lookfeaturing ‘drop-down’ menus for easy navigation through the site, from anywhere in the site, including a Couponslink where there will always be savings codes that will follow you throughout the order process. Choose the one that suits your needs, every time you order. 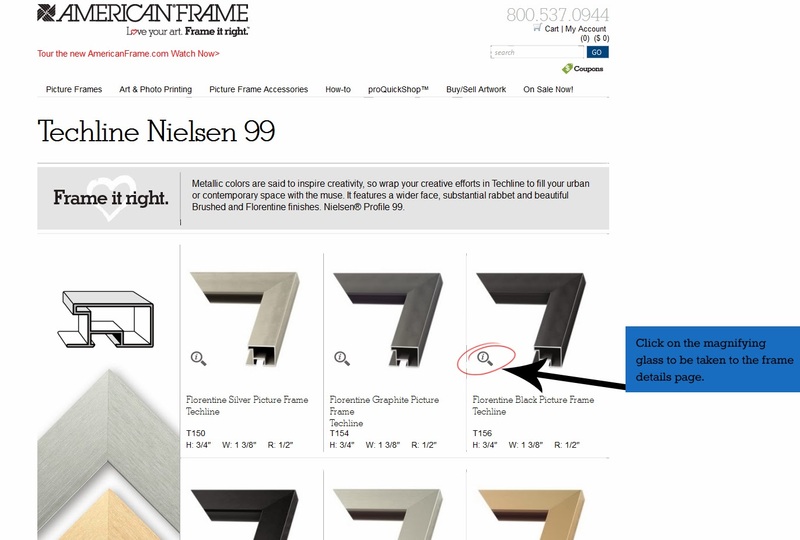 A new Frame Detail page for every frame in our line, featuring complete product descriptions including measurements, price charts, zoom images and a 360 degree view of each frame. It’s the first of its kind in our industry. We wholeheartedly believe this will be a favorite feature for frequent framers. 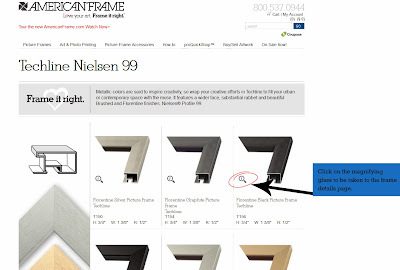 To access it, simply click on the magnifying icon within each frame corner view as you browse by Collection, Style or Color. From there, proceed to purchase or order samples. See example using the Techline, Nielsen #99. 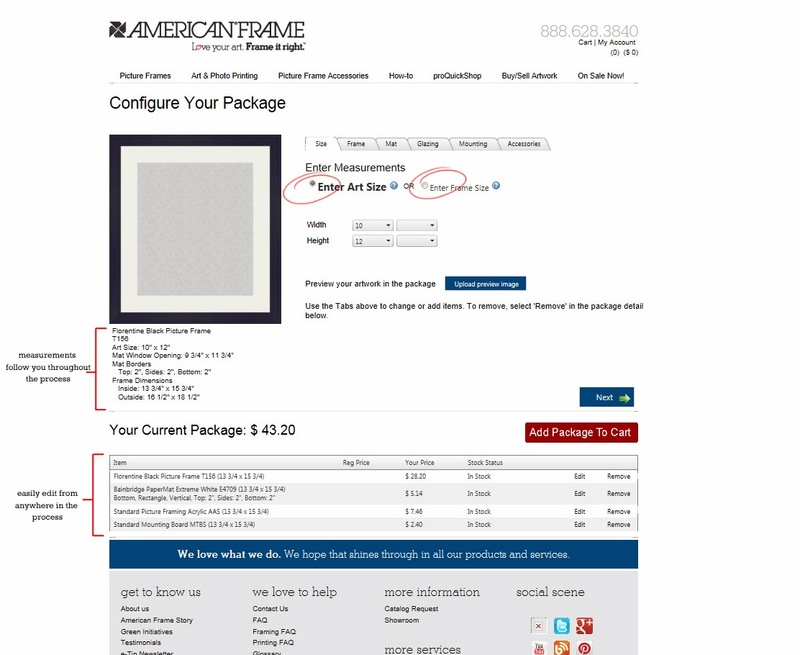 The option to design your custom frame either by artwork size or by frame size. 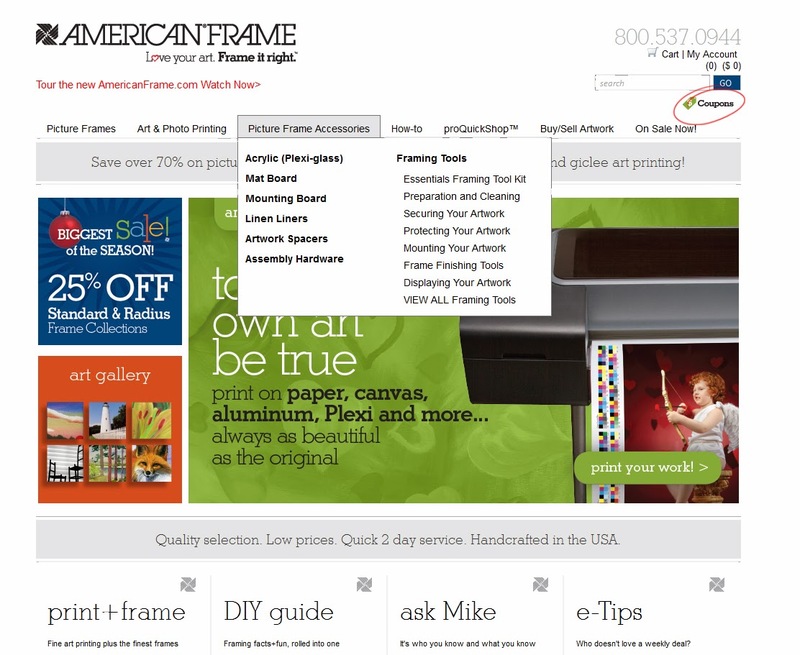 The art size is what we ask for on our current site which builds the frame from the inside out. Now you can order from the outside in as well. It’s an alternative that many customers have requested over the years. Whichever method you choose, ALL dimensions will be displayed throughout the entire ordering process for easy reference and measurement checking. These include the inside and outside dimensions of the frame itself as well as the art size the frame can accommodate given the sizes you input, and mat board opening size. Easy editing of frame packages all from one menu. No more bouncing around the site trying to figure out how to delete an unwanted item. At this level you will also be shown in real time, the stock statusof everything you are ordering – a useful new feature for those of you working on deadlines. In printing, notice the streamlined workflows and other enhancements including large file printing (up to 100MB), the introduction of new substrates including an Illford Bartya (Gold Fibre Silk), Slickrock Metallic, and integration of printing on archival Plexiglas® or Aluminum. Artists who sign their work before framing also now have more flexible finishing options with respect to mounting, matting and framing and assembly, right in the workflow, without the need for special order notes. Easier ways to save. 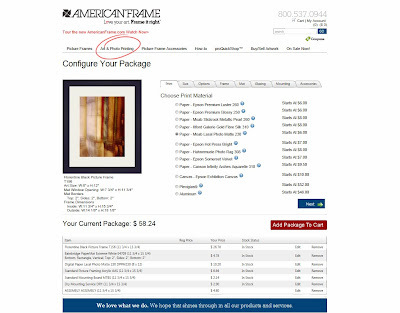 We are implementing a more aggressive discount schedule starting at 12 frames as opposed to our current 25, and as highlighted earlier, a custom coupon page where you can select the most appropriate savings for your order. 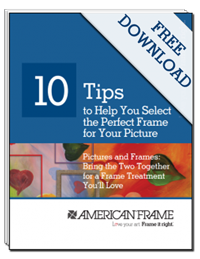 The ability to frame images smaller than 5”x 5”, allowing customers to frame images as small as a postage stamp, as long as matted size = 5”x5” or greater. Improved mat board ordering. Full sheets, reverse cuts and oversize boards are being added to our online offerings. These options are available both within the workflows and at the mat detail level. 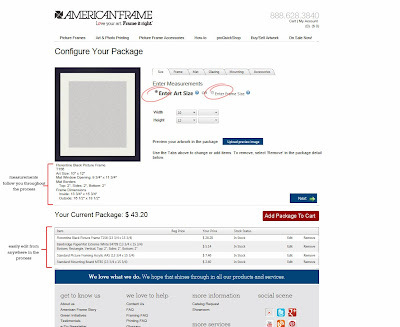 The ability to order samples online will only be at the mat detail shown below. Artists will enjoy a totally new and improved online art gallery with enhanced search options and a more SEO friendly site architecture so your customers can find your gallery on our site, which remains free of charge. To summarize, these are just a few of the most important improvements I am showcasing today for your review. In all, we’ve implemented over 90 enhancements in this phase of development. We take our position as the innovator in our industry very seriously and I anxiously await your feedback. 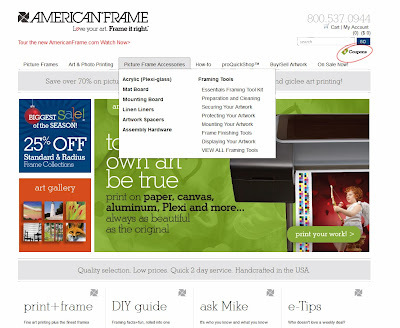 Try out the new site and either post your comments here, send me an email at lauraj@americanframe.com, or feel free to give me a call on my direct line at (419) 887-8099.